This is a review of Koios. 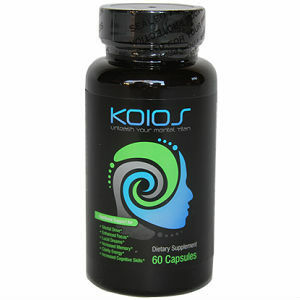 This product claims to help users attain mental dominance and maintain a healthy brain. It can enhance concentration, focus, cognitive function, memory retention, mental clarity, mental energy, thinking ability, alertness, oxygen levels, blood flow, neural connections, and brain capacity. You will learn more about this product as you read on. Vitamin B12- enhances mood and memory recall. It also supports nerves and red blood cell production. Vitamin B6- takes part in many enzyme reactions. It can increase mental capacity and improve mood. It also aids in neurotransmitter production. Alpha GPC- increases the levels of acetylcholine in your brain. Acetylcholine is vital for learning and memory functions. Bacopa- improves concentration, memory, and learning. L-Tyrosine- plays a part in dopamine production. Phosphatidylserine- supports cognitive function and memory. Ciwuija- increases endurance and enhances work performance. Guarana– enhances performance and reduces both physical and mental fatigue. Users should take two capsules per day, preferably in the morning before eating anything. However, small men and women are advised to start with one capsule before taking two capsules. You can only take a maximum of 4 capsules per day and this limit should not be exceeded. Users who are not affected by coffee can take the capsules with coffee. The effects of the product should manifest within 30 minutes. The manufacturer has carried out several clinical experiments without identifying any side effects. However, pregnant and nursing mothers should not take this product. Furthermore, it is vital to check the product label to ensure that you are not sensitive or allergic to the ingredients. A bottle with 60 capsules costs $49.95. Two bottles with 60 capsules each cost $85.00 while three bottles cost $120.95. Therefore, you can save by buying two or three bottles at once. The price of this product is high compared to the price of other products in the market. We believe that a high price signifies quality. The manufacturer offers a 100 percent satisfaction guarantee in case you are not contented with the results. You can get a total refund of the purchase price if you notify the manufacturer within thirty days from the purchase date. This guarantee shows that Koios is a quality product. We also found several positive customer reviews, which also show that this product satisfies the needs of consumers who have tried it. Koios is the ideal product because of its numerous advantages. This product contains a very strong blend of scientifically proven ingredients that can perform the alleged functions. Moreover, the manufacturer is confident that the product is 100% effective. Numerous positive reviews from customers also make Koios a top-notch product. You can also buy the product at discounted prices. This product is also GMP certified, unlike some of the products in the market. However, Koios may have some side effects on individuals who are allergic to the ingredients. Additionally, the price is high for users who prefer buying one bottle at a time. Henry Costa	reviewed Koios	on June 29th	 and gave it a rating of 3.5.